A Healthier Cookie That Doesn't Taste "Diet-y"
No really, healthy cookies that taste good! Is it just me or when you hear that a cookie is packed with fiber, is low in sugar, has whole grains and is a healthy choice, do you also tend to think that the cookie isn’t going to be too tasty? For this reason, I have a tendency to let “diet” cookies sit on my desk for awhile, as my nairn’s cookies have been doing. But as always in this line of work, I was proven oh-so wrong! 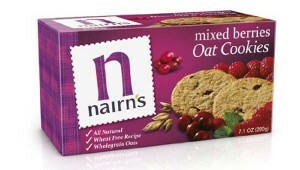 Nairn’s, a Scottish brand, has me thinking the Scots are doing something right besides wearing kilts. The cookies are wheat-free, vegan-friendly, contain no artificial colors, flavors or preservatives, no trans fats and include whole-grain oats. Sounds boring, right?